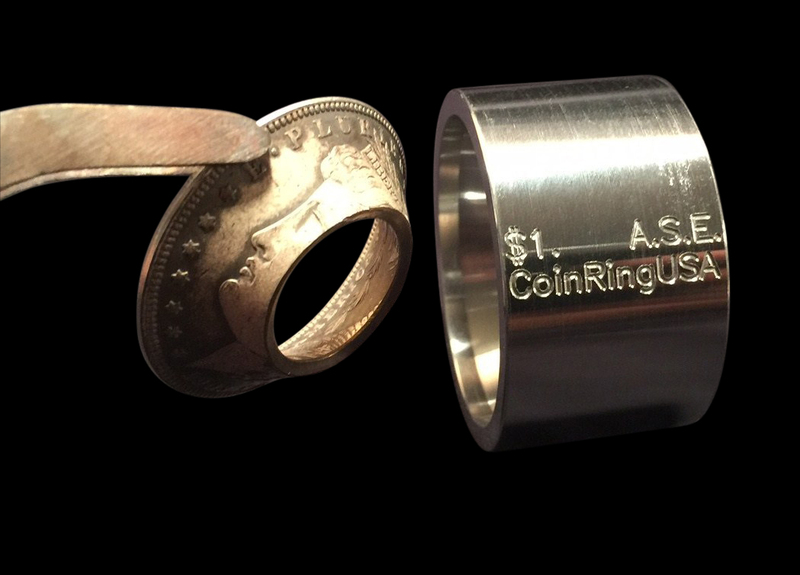 Visit my Shop page at: http://www.CoinRingUSA.com for the highest quality coin ring-making tools available today to help you make the best coin rings! Reduction die set made of Hardened Stainless Steel and CNC-machined to a smooth inner wall finish. Also called Reducer Dies or Compression Dies, the reduction dies that I offer are made in the USA of precision CNC-machined Hardened Stainless Steel; are all double-sided, and are used to begin the process of folding over and then reducing US Quarters, US Half Dollars, Presidential Dollar coins, Dollar-sized Coins and the American Silver Eagle coin. All of my reduction dies have been precision engraved with the corresponding size on each opening side for easy identification. These reduction dies can be used along with either the plastic bearing balls or the New Folding Cones to fold the coins, while leaving no marks, scratches, or marring, thus preserving 100% of the detail on the inside of the coin. NOTE: The outer diameter openings of my 4-reduction die set can accommodate coins in size from 1.6″ (inches); down to 1.1″ (inches), so if you live in another country or plan on using foreign currency, please make sure that you know what size diameter the coins are that you plan on making into coin rings. Visit my Shop page to pick up a set of these Universal Folding and Reduction Dies. Die # 1: This Universal Reduction Die, as well as my 2 other newest tools that I designed, the “Stabilizing” Reduction Dies, are all made of the highest-quality Hardened Stainless Steel, are precision CNC-Machined, are all double-sided, and are used to fold and reduce ANY coin, token, or medallion that is between 1.6″ inches (40.64mm) in diameter, down to 1.5” inches (38mm) in diameter. For example, the 1.6” side is large enough to fit the American Silver Eagle coin; and the 1.5″ opening on the other side is large enough to fit the Morgan / Peace Dollar-sized coin. Die # 3: This Universal Reduction Die is made of the highest-quality Hardened Stainless Steel, is precision CNC-Machined, double-sided, and can be used to fold and reduce ANY coin, token, or medallion that is between 1.2″ inches (30.4 mm) in diameter, down to 1.1” inches (27.9 mm) in diameter. It can be used to further reduce U.S. Half Dollar coins, Dollar-sized and American Silver Eagle-sized coins to the smaller sizes. It can even be used to reduce the Presidential Dollar coins, the Sacagawea Dollar coins. 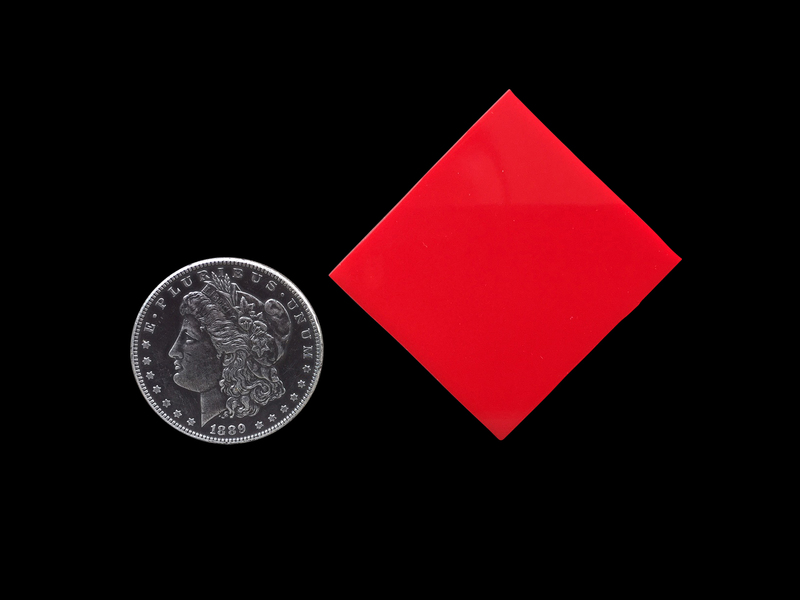 Die # 4: This new Universal Reduction Die has a 1.0″, (25.4 mm) diameter opening on one side, and a 0.9″, (22.86mm) diameter opening on the other side, and can be used to begin folding over ANY foreign or domestic coin, token, round, or medallion between 1.0” and 0.9” in diameter. It can also begin to fold and reduce the smaller-sized US coins such as the US Nickel, the US Penny, etc. By popular demand, and because of the many requests from customers, I am now offering this NEW, smaller double-sided reduction die; as many have asked to have a smaller die size than the previous smallest 1.2” x 1.1” diameter die found in most Reduction Die Sets to work the smaller-sized coins. Die #5: This Universal precision engraved double-sided reduction die also has an opening measuring 1.2″ on one side, and a 1.1″ opening on the other side, but the difference is in the unique 25° of taper on the inside walls of the die. 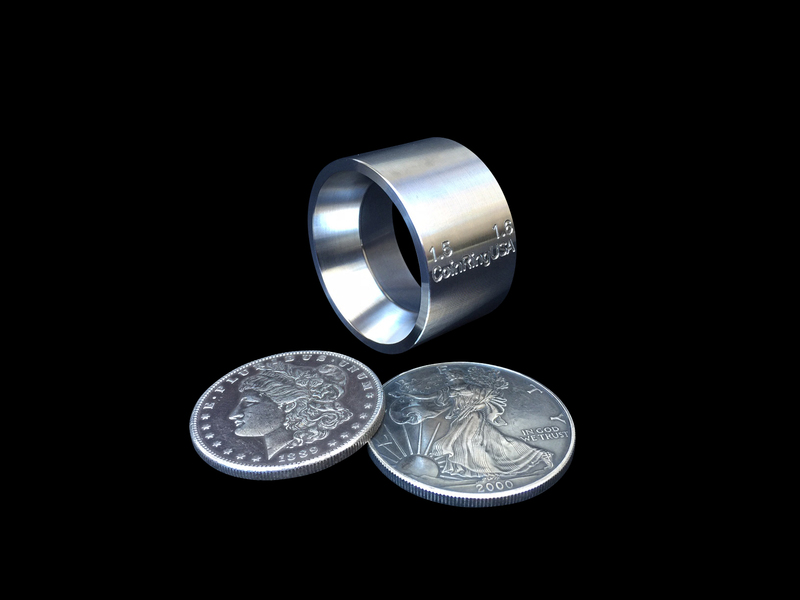 This was specifically designed and is used to get the smallest sizes possible on the larger coins during the FINAL stage of sizing, and it also allows for the detail on the outside of the coin ring to be better protected while reducing during the final sizing. 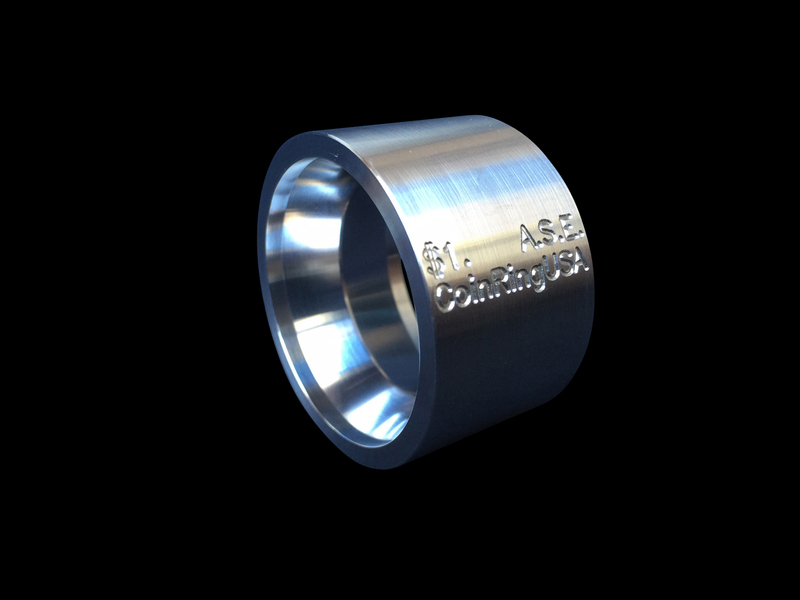 Every die has been precision engraved with the corresponding size opening for easy identification. * NOTE * This die should be used after the initial reducing has been done from the other dies in the set, and not by itself alone. This die will help your coin ring to achieve more of the “rounded edge”, (or ‘Fat Tire’) look. Know the 4 things to look for BEFORE you buy any Reduction Dies. 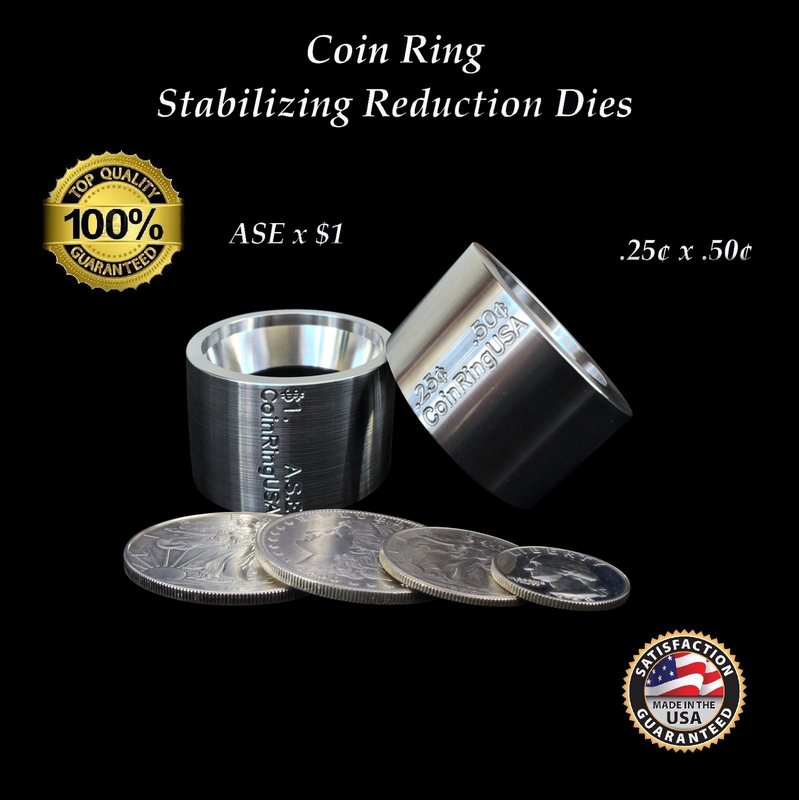 I designed these NEW dual-purpose “Stabilizing” Reduction dies to initially fold over the US Quarter, the US Half Dollar, the Morgan / Peace Dollars, and the American Silver Eagle coins. With these dies, you can now make a level and straight first initial fold, because the coins’ outer edge is making complete contact with the edge of the counter bore straight wall design of the die that stabilizes the coin. (Note the red arrows in the photo below; they are pointing to the area where the coin “sits” completely stabilized before it’s folded down). These two dies make a great compliment to the existing universal reduction dies; as those dies are needed to further fold and reduce the coins to the final size and shape you are looking for. Of the many requests that I have received from people to offer a reduction die for the US Quarter… here it is, only better! “.25¢” and ” .50¢” Stabilizing and Reduction Die. The coin “sits” completely stabilized at the top of each side of the die before it’s folded down. “.50¢” Walking Liberty Half Dollar completely stabilized before folding over. “$1.” Morgan Dollar completely stabilized before folding over. “$1.” and “A.S.E.” Stabilizing and Reduction Die. (A.S.E. means American Silver Eagle.) The coin “sits” completely stabilized at the top of the die before it’s folded down. The die has an opening on one side that is machined to fit and stabilize the Morgan & Peace Dollars on one side, and machined to fit and stabilize the American Silver Eagle on the other side. With this dual-purpose die, you can now make an even and straight initial fold to the coin, because the coins’ outer edge is making complete contact inside the counter bore straight wall design of the die. This can also be used as a reduction die after you’ve made that crucial first fold, as the inner walls are pitched at an optimal degree of angle to allow for making the best-looking coin rings without sacrificing detail. 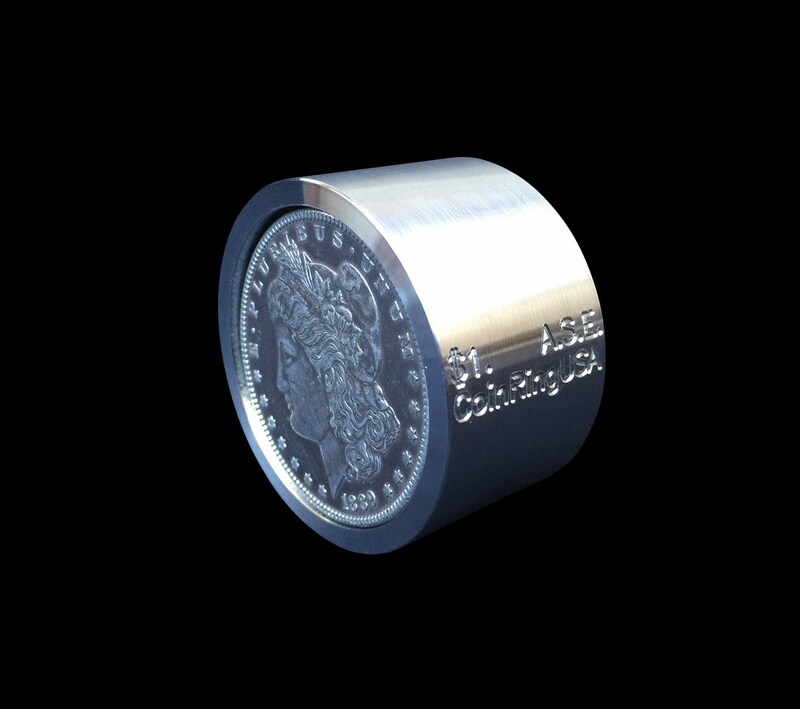 They can be used with the plastic bearing balls to fold the coins, while leaving no marks, scratches, or marring, thus preserving 100% of the detail on the inside of the coin. 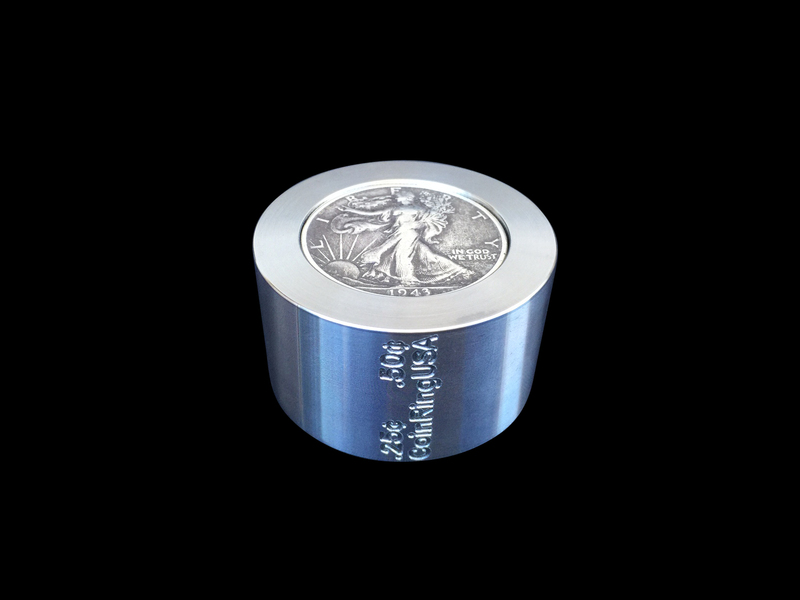 NOTE: You will need to have the 1.4” x 1.3” die to continue the process of folding the Morgan & Peace Silver Dollar and the American Silver Eagle. Visit my Shop page here to pick up the NEW Stabilizer Reduction Dies. 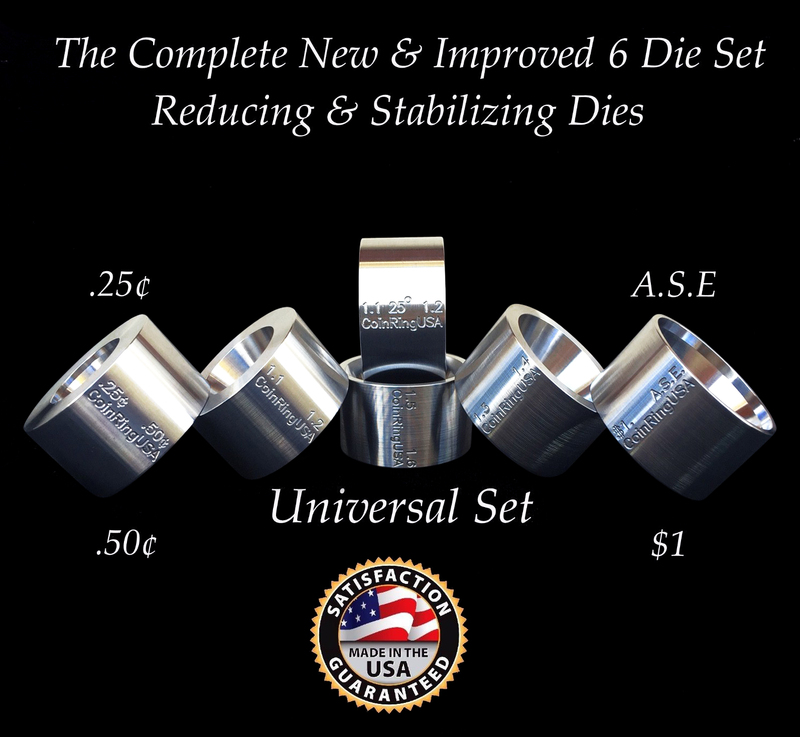 Here’s the direct link to pick up the MASTER Set of Universal Folding/Reduction and Stabilizer Dies. 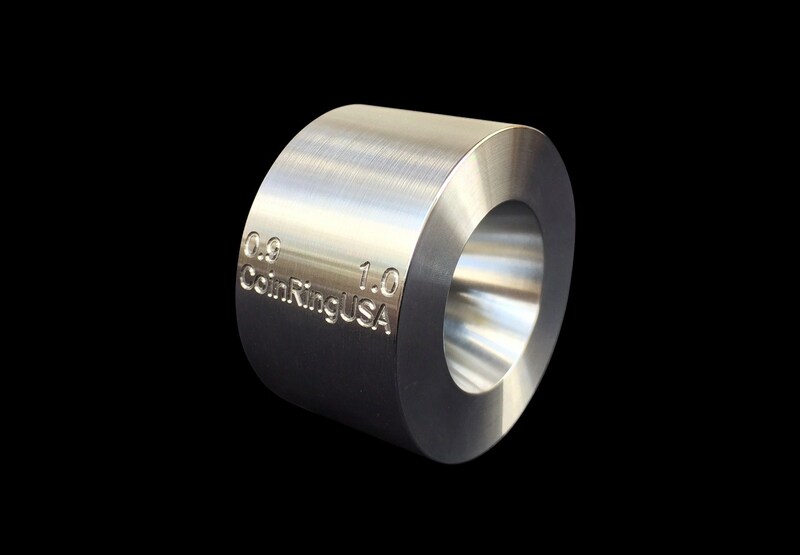 This universal stainless steel starter cone has a revised lower profile, allowing for the clearance necessary to use on ring sizing machines with low ram head clearances, especially when the “Stabilizing”/Reduction Dies are used to punch a center hole into a US Quarter, US Half Dollar, Morgan/Peace Dollar, or the American Silver Eagle coins. This new starter cone is designed to begin folding coins with 1/4” center-punched holes, all the way up to 5/8”+ center-punched holes. The first initial fold produces the most wear and tear on your folding tools. By starting the fold with this tool, the folding cones and delrin balls are not subjected to the sharp edge of the center-punched hole in the coin, therefore greatly reducing wear on your folding tools. This starter cone also works great in conjunction with my 2 “Stabilizing”/Reduction Dies, as you have more stability during the first crucial press due to the coin being completely level and stabilized when folding over any US Quarter, US Half Dollar, Morgan/Peace Dollar, or the American Silver Eagle, (see the below photo for reference). IMPROVED FOLDING TOOL! 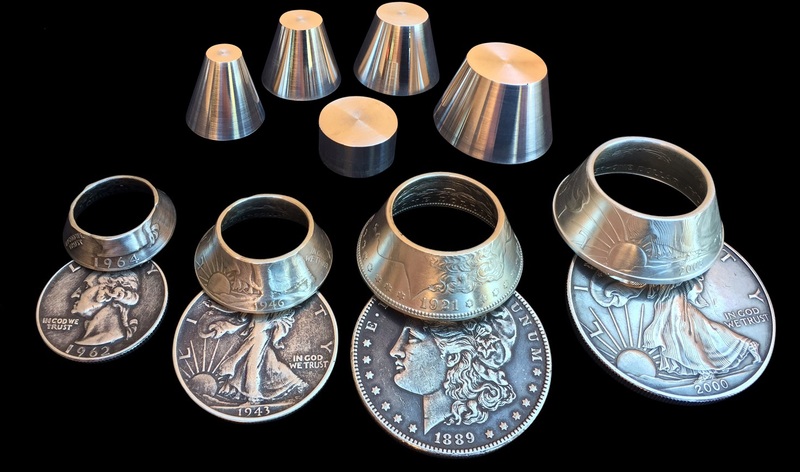 The Universal Stabilizing Folding Cones to fold over any Coin Ring! This is the newest, most effective and simple ways at folding a coin over for the purpose of making it into a coin ring. 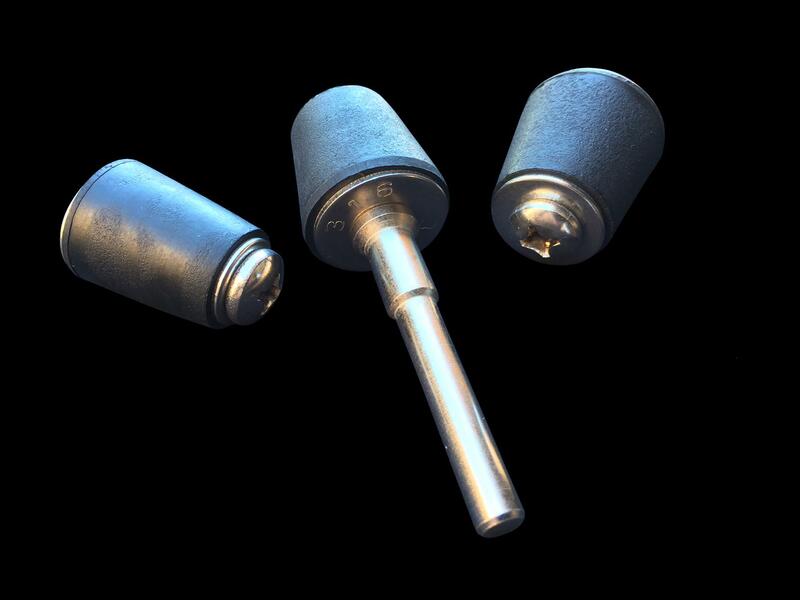 These new Stabilizer Folding Cones (made from wear-resistant and hardened stainless steel) are a more effective and efficient option than using the delrin bearing balls. Their cone-shaped design allows them to do a much better job of keeping the coin level as it’s being folded over into the reduction dies when using either a Ring Sizer Machine, an Arbor Press, or a Hydraulic Press. You don’t need to memorize which particular size folding cone fits into which size center hole in the coin you are about to begin folding over. Instead, you want to pick the stabilizing folding cone that fits into your coin’s center hole, that will also fit under the ram head on your Ring Sizing Machine, Arbor Press or Hydraulic Press. Then, as you continue to fold your coin down into the reduction die, you simply switch to a SMALLER diameter-sized reduction die and a LARGER-sized folding cone (and the spacer provided if needed) to finish the coin’s folding-over process. 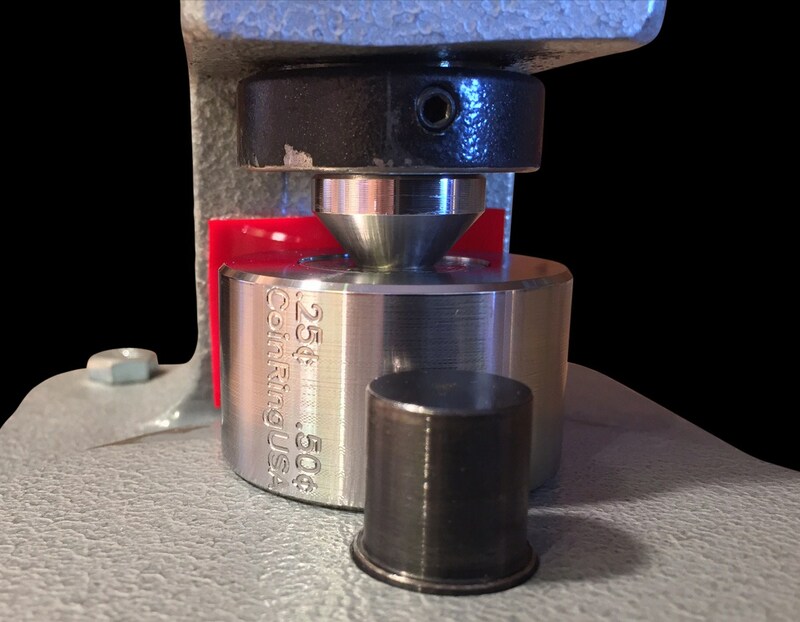 The general idea behind this new tool is the same as that of the delrin folding balls: you set the coin level into your reduction die, then insert the folding cone that both fits into your coin’s beveled and softened center-punched hole, and will also fit under the ram head on your Ring Sizing Machine, arbor or hydraulic press. As you continue to fold your coin down into the reduction die, you simply switch to a SMALLER diameter-sized reduction die and a LARGER-sized cone (and use the spacer provided if needed) to finish the coin’s folding-over process. These new folding cones also work great with the Stabilizer Reduction Dies, as you end up having TWO TIMES the stability when folding over any US Quarter, US Half Dollar, Morgan/Peace Dollar, or the American Silver Eagle. 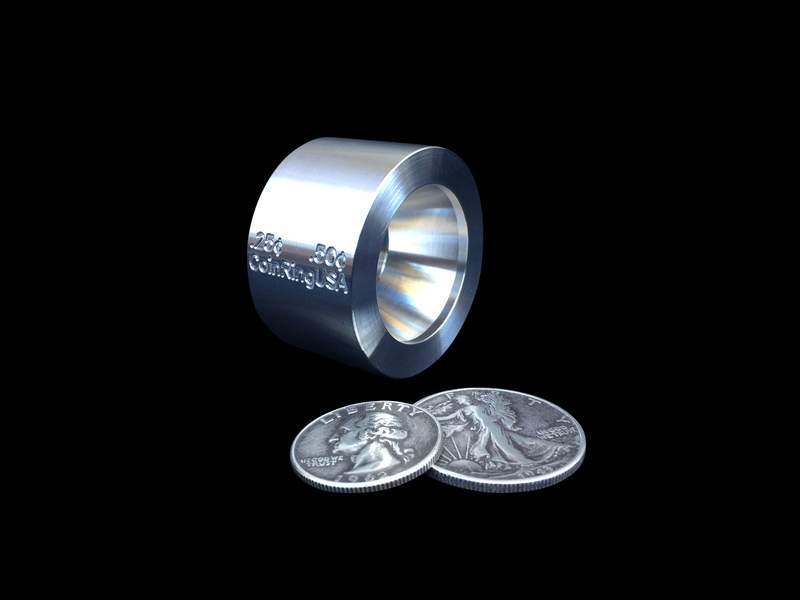 — The 3/8″ folding cone is used in folding over quarter-sized coins, half dollar-sized coins, and American Silver Eagle-sized coins. For example, this is the first cone that you would use when beginning to fold a Silver Eagle-sized coin that has a 5/8″ inch (15.8mm) center hole punched into it; as well as a US Quarter-sized coin with a 3/8″ inch (9.5mm) hole, or a 7/16″ inch (11mm) sized center hole punched into it. 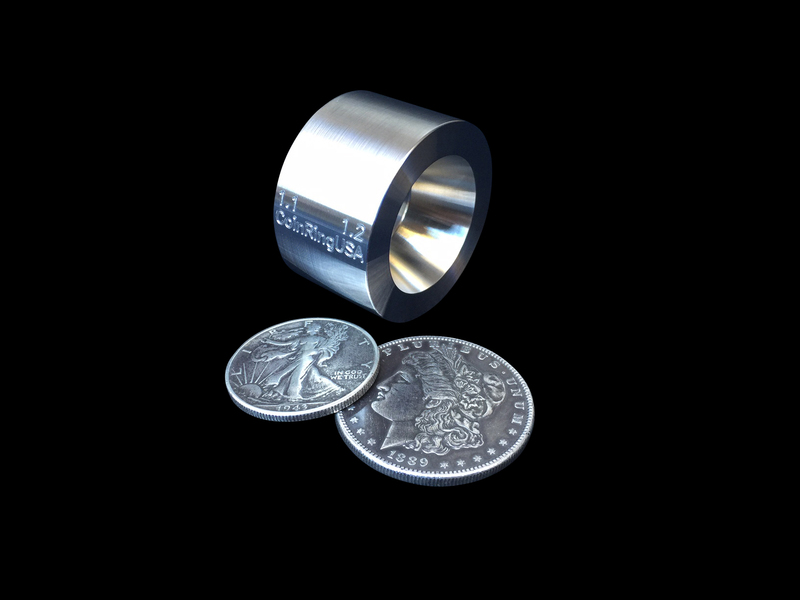 — The 1/2″ folding cone is used in folding over Half Dollar, Dollar, and American Silver Eagle-sized coins. This is the first cone that you would use when beginning to fold a Half Dollar-sized coin over with a 7/16″ (11mm) hole in the center. 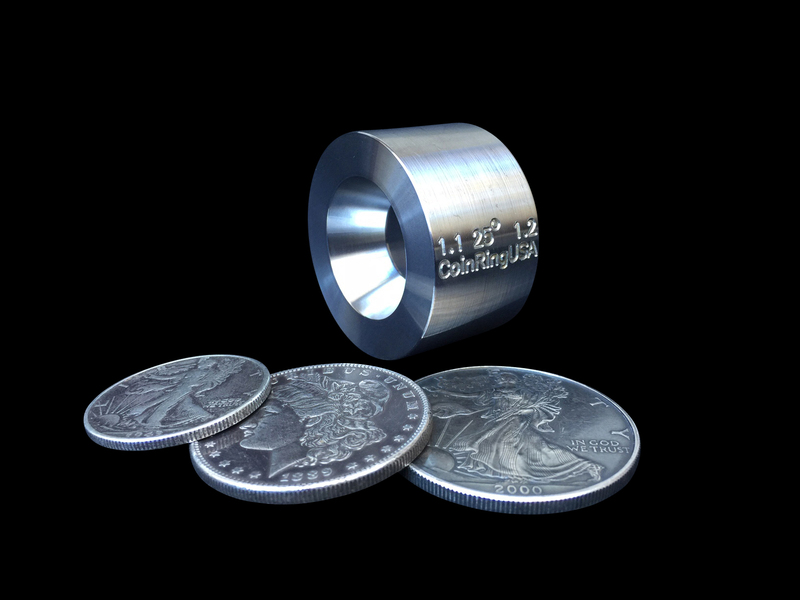 — The 5/8″ folding cone is also used in folding Half Dollar, Dollar, and American Silver Eagle-sized coins over. This is the final size cone that you would use to finish a Half Dollar-sized coin. 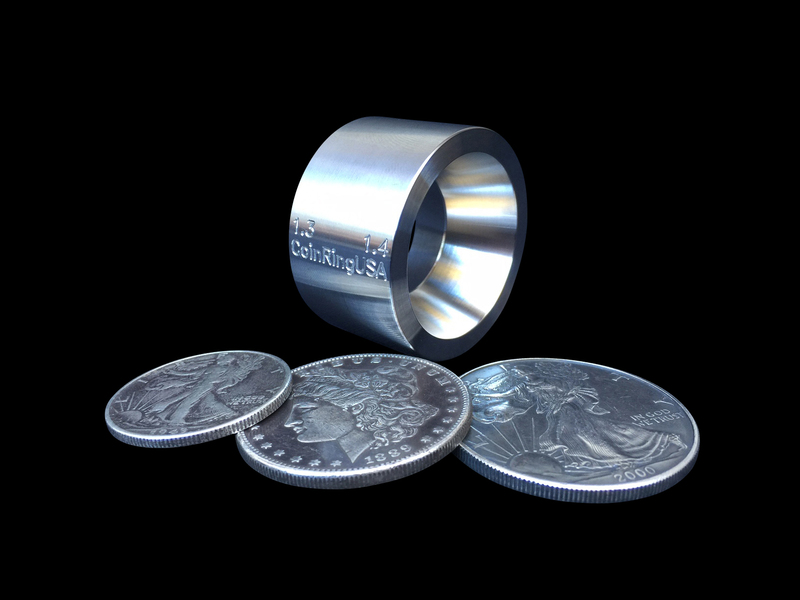 — The 3/4″ folding cone is used in folding Dollar and American silver Eagle-sized coins. This is the final cone to use when finishing a Morgan Dollar sized coin and also the last cone to use (with the larger-sized flat spacer provided) when you’re finished folding an American Silver Eagle-sized coin. * The included spacer provides coverage to the top flat part of the folding cone being used and it also helps to provide a longer reach of the ram as it’s needed to push the folding cones further down through the center hole into the coin when the extra room is required. 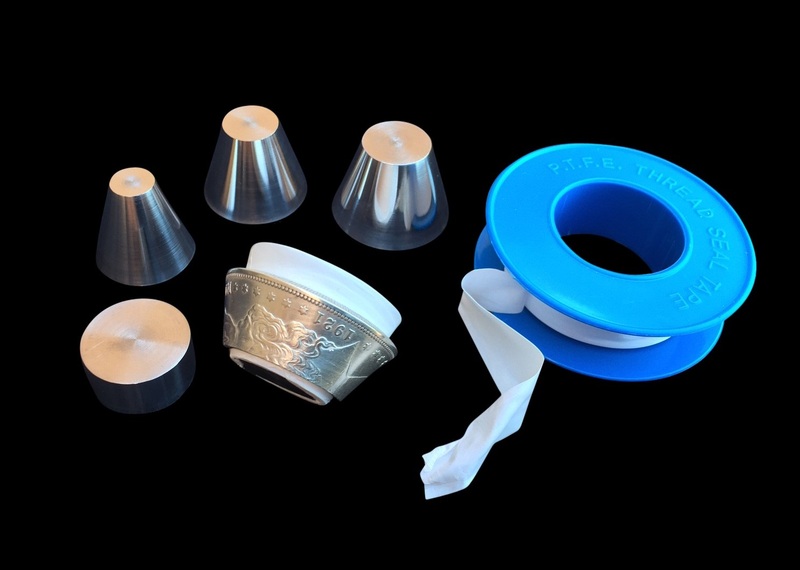 *** IMPORTANT NOTE *** You don’t need to memorize which particular size STABILIZER folding cone fits into which size center hole in whichever coin you are about to begin folding over. Instead, you want to initially pick the folding cone that fits into your coins’ center hole, that will also fit under the ram head on your Ring Sizing Machine, arbor or hydraulic press. As was indicated earlier; you continue to fold your coin down into the reduction die, you simply switch to a SMALLER diameter-sized reduction die and a LARGER-sized folding cone (and the spacer provided if needed) to finish the coins’ folding-over process. 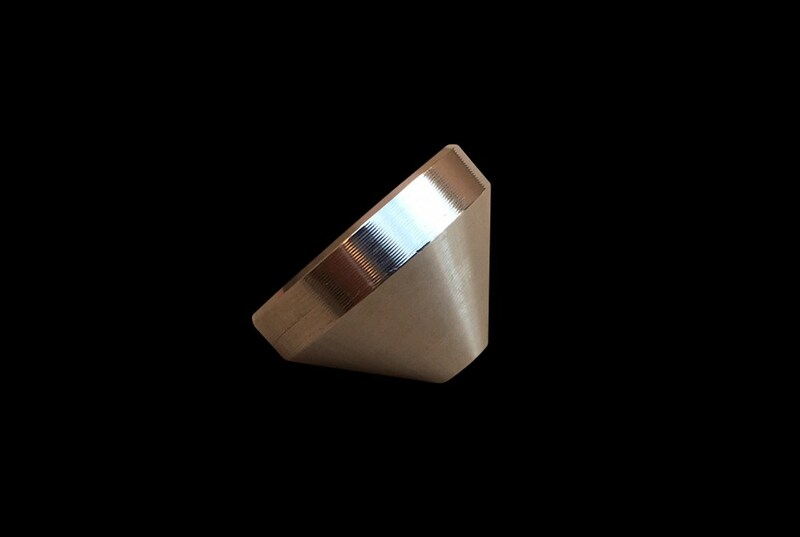 All of the folding cones are machined from hardened stainless steel and CNC machined to teh highest standards. Watch as I fully fold a Morgan Dollar using these new cones with 100% of the detail preserved! Now you can obtain the best, most rounded and uniform high quality smooth, shiny, and even finish to the NON-REEDED edges of your coin rings by quickly getting rid of those unsightly, uneven, flat edges. * “Wow, fast shipping! The Polishing Mandrels are really good, by far my favorite part of coin ring making is now the Finishing & Polishing part with these mandrels, thank you Martin!” — Francisco V.
* “Martin is fantastic with customer service before, during, and after the sale. I received this Finishing & Polishing mandrel set and I can’t say enough good things about them. It has taken my work to a professional level and I don’t know how I did without them. 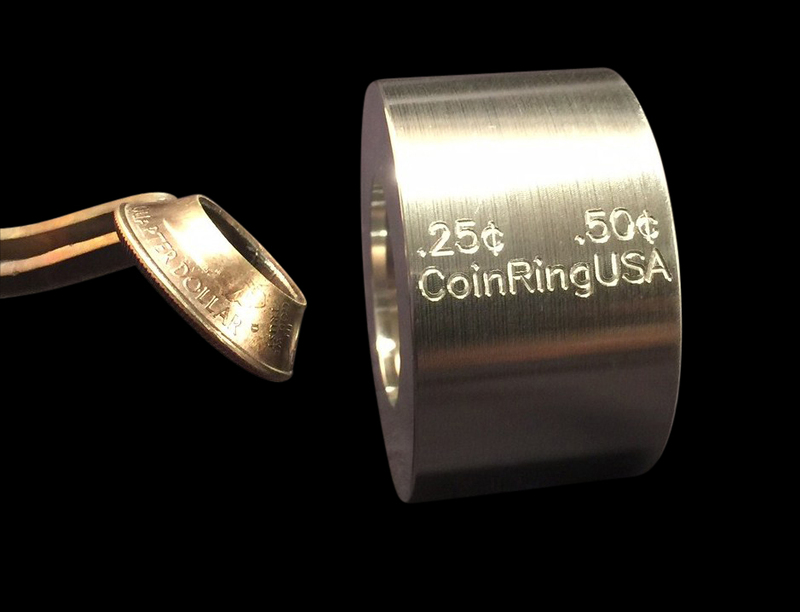 Thanks.” — Ray S.
* “This is the best thing I have purchased in coin ring making. Thank you for such an amazing product!” — Larry M.
* “This fills a niche not previously addressed, and is almost a necessity to produce a quality ring!” — Dale C.
* “Awesome! The finish on my coin rings has improved 1,000 percent with this set. Thanks!” — Bob T.
* “A first class addition to my tool kit that produces the same quality finish that is demonstrated in the online video.” — Michael N.
To change from one size to another, you simply hold the tapered rubber mandrel with one hand and twist the stainless steel shank with the other…. no tools are necessary! The advantage to using the finishing and polishing mandrels is that as the ring is held on tightly to the tapered mandrel that’s spinning while being attached to your power drill; it acts much like a small lathe, providing a much more uniform finish to the ring than can be achieved with either hand-sanding, using a nail buffing file, a steel round-file, or even a small rotary tool such as a Dremel. 4.) 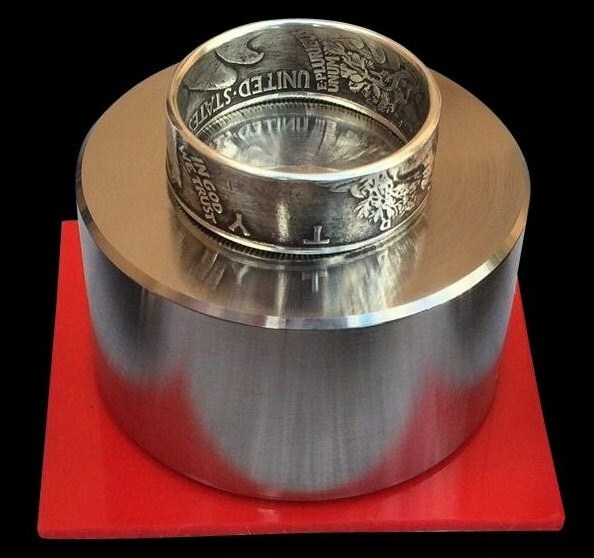 Begin on the outer edge of the coin ring with the coarser 100 Grit sandpaper and work your way around to the inner edge of the coin ring; making sure that ONLY the corner tip of the sandpaper is making contact with the unfinished inner, top, and outer edges of your coin ring to prevent damage to the rings’ detail. Take your time with this step; especially when you’re first starting out. 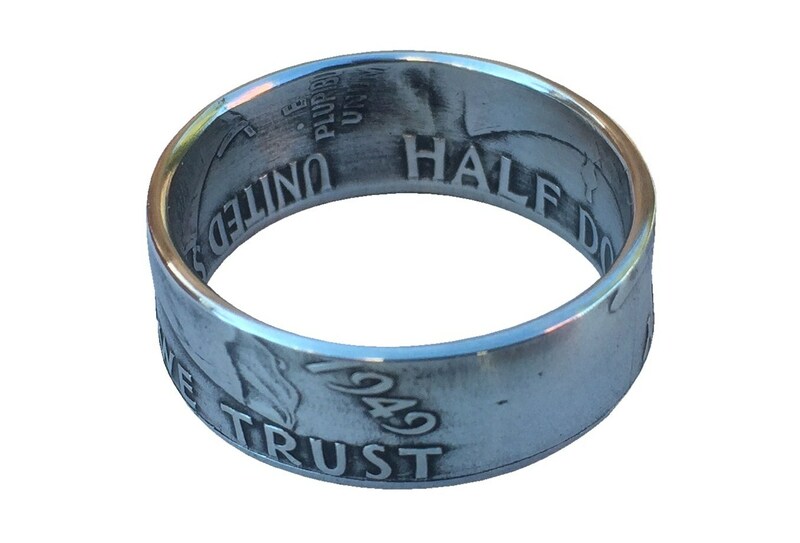 BEFORE and AFTER photos… take a look at the comparison in the edges of the same coin ring! OTHER MATERIALS NEEDED: a power drill, 3 different grits of sandpaper (100 Grit, 400 Grit, and 600 Grit ideally), some “0000” Steel Wool, and a jeweler’s polishing cloth to complete this process. Those items can be purchased from Amazon.com; at a big box store like Home Depot, or any local hardware store inexpensively. 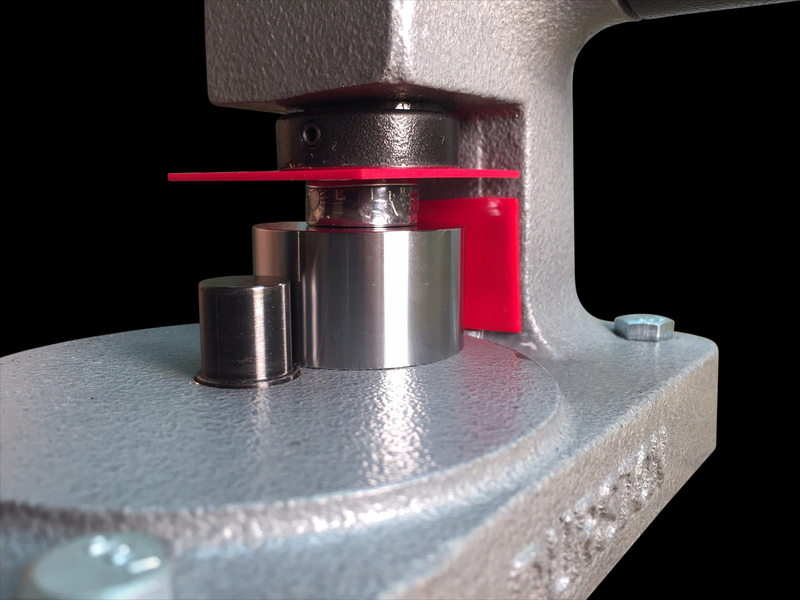 The Coin Ring Repair Die (pictured above) is made out of a solid piece of Hardened Stainless Steel and can also be used as a sizing “Press Plate” when you’re using an arbor press or a hydraulic press to reduce your coin down to its’ final shape and size.